PTWT and the people of Pembroke celebrate the town's incredible Medieval history by linking hands around the Pembroke Town Walls. Thank you to the very many people from the Pembroke community who came out to celebrate the incredible history of our walled town and to promote the work of the Pembroke Town Wall Trust in restoring and repairing the Medieval Walls. Together we were able to hold hands around a large portion of our walled town in a powerful and symbolic gesture. Time is counting down to the big event and don’t forget children can also be sponsored to take part. Please take a selfie of yourselves in front of the walls and tell us the condition of the walls behind you and give us a mark out of 10 and then send it to our facebook page. Everyone can make a big difference. The Vines family linking their hands in front of the gun tower on the southern walls. The Vines family were practicing last Saturday for an unusual and unique event to be held in Pembroke on Saturday 19th November at 12 noon. 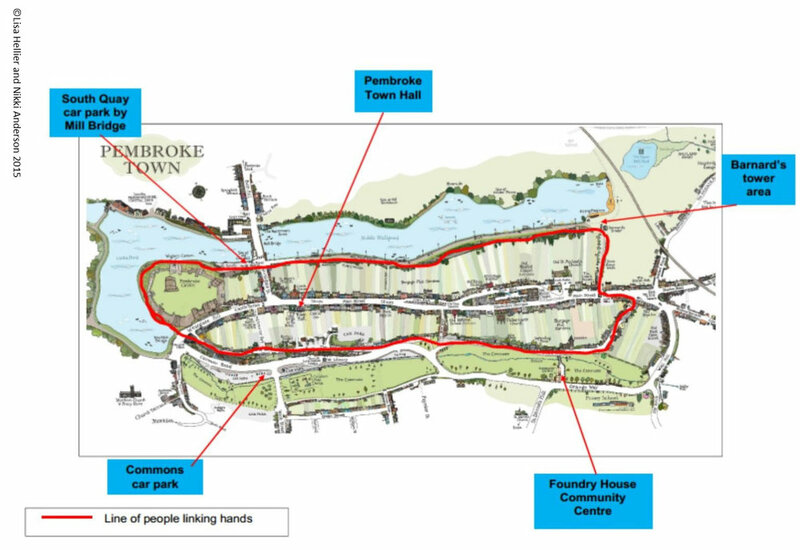 Local people of all ages will link hands around the entire medieval walled town to replicate the logo of the Pembroke Town Walls Trust, a crown of people holding hands. Why? To celebrate Pembroke’s wonderful heritage reflected in the historic stone walls first built by William de Valance to surround and protect the town and its castle in the 13th Century. To raise awareness of the walls both locally and nationally and the work that the Pembroke Town Walls Trust is doing towards their restoration. So the Trust is inviting people – local, not so local, visitors, children, young people, parents, grandparents, absolutely anyone who would like to join in - to gather from 11.30am on the day for the “linking” at 12 noon. At least 1500 people are needed to provide a human circle all around the town – just 300 families like the Vines will do it! Gather points will be the Commons Car Park, the South Quay, Barnard’s Tower area and the Foundry House car park. From there stewards will tell people where to go and make sure that everyone is linked and to keep everyone safe. The “linking” will be preceded and followed by guided walks around the walls in the morning and afternoon – Phil Carradice leading a Norman Walk; the Pembroke Civic Trust leading a Town Trail, Pembroke Millponds Action Group leading a Nature Trail and the Pembroke Story group leading a Junior History Detectives walk. There will be tea and cakes available at Foundry House and at food outlets all around the town. A full programme with where to go and timings is available on the website pembroketownwallstrust.org.uk or on Facebook. Funding from the Big Lottery Celebrate programme will cover the costs of the event but children will be able to secure sponsors at £1 each which will go towards the costs of the Trust’s pilot project – the restoration of the walls surrounding the burgage garden behind the Tabernacle URC Church. Come along and play a part in Pembroke’s long & rich history. Download your sponsorship form here! The Pembroke Town Walls Trust would like to thank everybody who has supported the Climb through Time Crowdfunder project. We have really enjoyed getting out and talking to so many of you in Pembroke and have been struck by the level of enthusiasm and interest in what we are trying to achieve. We are so pleased to have exceeded our target and we are incredibly grateful for so many kind and generous donations from the Pembroke community and beyond. This success is one of many exciting leaps forward for the Pembroke Town Walls Trust. Please follow us on facebook (@pembroketownwallstrust) to see the progress on the staircase and Tabernacle garden and to see new developments in our long-term work to repair and restore the Medieval town walls of Pembroke. Display our project on your own website - the Crowdfunder widget can be embedded on your and your partner websites. Climb Through Time: A staircase and viewing platform with views across the South of Pembroke. The Tabernacle garden is being transformed into a stunning community space that celebrates the substantial history and heritage of Pembroke. We need your support to build a dramatic staircase and viewing platform that will stand 40 feet above the commons and link the Tabernacle Garden to Main Street through the Tabernacle Church. The staircase will complete the Tabernacle Garden and create an incredible public space for the all members of the Pembroke community and our many visitors to explore and discover. With your support we can build the staircase and complete this exciting and innovative attraction. Pembroke Town Walls Trust hold their 2016 family party in Pembroke Castle on Saturday June 18th, from 5 pm until 9 pm. Admission will be taken by Pembroke Town Walls Trust on the day, and is £5 per adult & £4 per child, to include a drink and Welsh cake on arrival, also access to the Castle itself. Please bring your picnic rugs, chairs and a picnic if you wish. However, the Castle cafe will be open. A nice cold beer, glass of wine and "something prepared for you" is far easier! There will be lots to entertain and interest you all. Pembroke's Heritage and Pembroke Town Walls Trust Pilot Project members will be there to answer questions on their displays and research. Modern day artists demonstrating ancient crafts are volunteering their time too. A potter and a ceramic artist will each invite you to try your skill. A local beekeeper selling Pembrokeshire honey with a wealth of information on his craft. Pembrokeshire Woodturners will be producing and displaying gifts to purchase. Pembrokeshire Falconry are with us. Why not have your photo taken with a huge variety of these beautiful birds. Pembroke Town Walls Trust have devised a fun but educational drawing competition with local primary schools. The prize winner to be chosen at the event. Pupils have to draw their vision of an historic, peaceful garden once inside the town wall behind the Tabernacle church. PLEASE BRING YOUR COMPLETED DRAWINGS TO THE CASTLE EVENT to have your chance to win. The Castle Dragon has been hiding it's eggs around the Castle again. Children, why not see if you can help Carys find them all !! There will be a prize for the winner. Well known local band the Crooks open the event and play throughout the evening. The Quaynotes choir and the Razorbills will be entertaining you too. Your support plays a vital role in Pembroke Town Walls Trust reaching their gaol to restore the first part of the Pembroke Town Wall to the rear of The Tabernacle church. Altogether a very exciting project. We look forward to welcoming you to Pembroke Castle on Saturday June 18th. Book tickets online for this and other upcoming events. The Town Wall Trust are very excited to announce that the Pembrokeshire County Council conservation officer and CADW have considered and granted Listed Building Approval for the exciting development at the rear of Tabernacle URC. Works have started in ernest with the garden and the removal of the toilet block.